YOU'VE GOT QUESTIONS ABOUT CLIMBING THE TALLEST MOUNTAIN IN AFRICA? What is Kilimanjaro? What makes it so special? What can I do to make sure I get the most out of this experience? What's a normal day on the mountain like? What makes traveling with WHOA different? How do you choose your local operators? Do you have recommended reading to help me plan and prepare for Kili? How do I sign up for one of your Kilimanjaro Adventures? When do your Kilimanjaro Adventures start to fill up? When do you recommend booking? I'm a solo traveler. Do people usually know each other, or are there other solo travelers like me? How do I pack for Kilimanjaro? How do I prepare for the altitude? What's high altitude sickness? What shots and vaccinations do I need? Once I get to Tanzania, how do I meet up with the group? Kilimanjaro is located in Tanzania on the north border near Kenya, and has the highest point in Africa, Uhuru Peak (5,895 m). It is the tallest free-standing mountain in the world! While classified as a mountain, Kilimanjaro is actually made up of three volcanic cones that were formed by the Great Rift Valley. Kilimanjaro is one of the seven summits, but it's not classified as a technical climb, and is sometimes called Everyman's (or Everywoman’s!) Everest because it’s the most attainable of the world’s seven summits. Check out our KILIMANJARO ADVENTURE GUIDE for a trail map and more info on its magnificent and diverse wildlife, climate zones! Kilimanjaro is extra special to us because WHOA travel was born in 2013 when Co-Founders Allison and Danielle climbed Kili for the first time, and experienced the unstoppable power we all have to conquer challenges when we join forces and put our minds towards achieving something amazing. It was something they knew they needed to share with other women around the world! 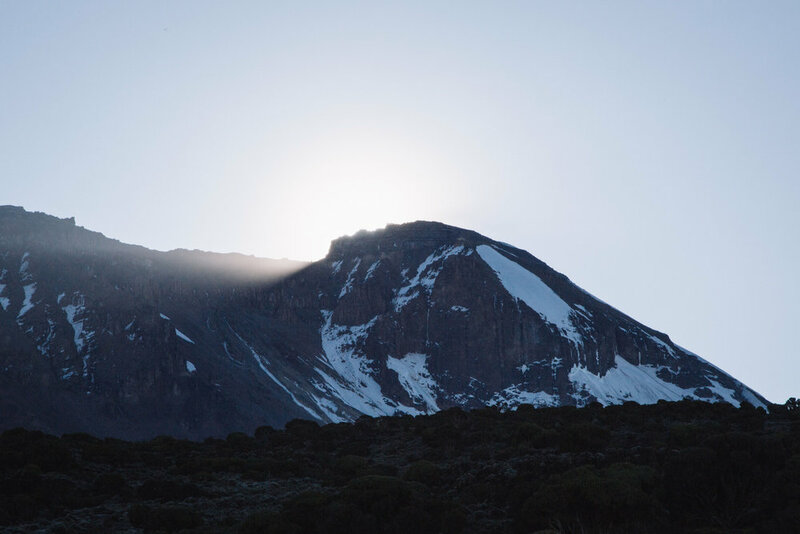 Summiting Kilimanjaro is the accomplishment of a lifetime, and, we know first hand, it's one that will leave you with a changed perspective of yourself and the world around you. Nothing worth having comes easy, but with dedication, and the support of the WHOA family, you can stand on the roof of Africa! 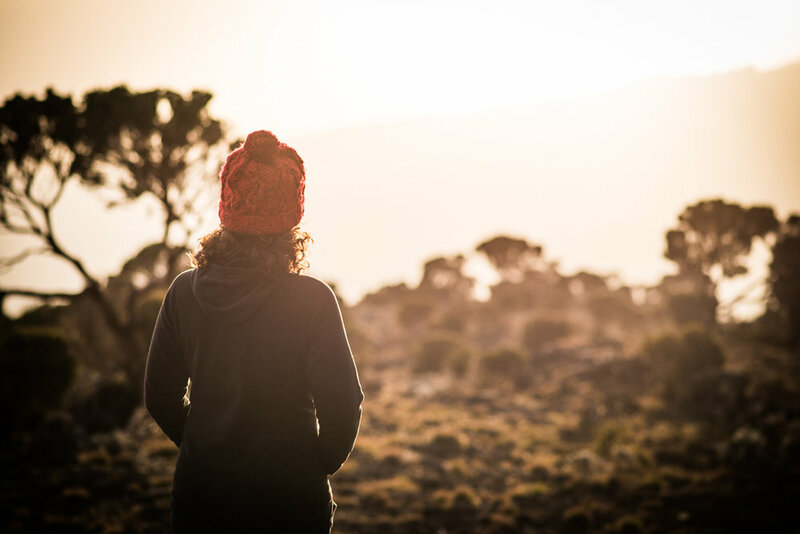 Empowering and connecting women through adventure is at the heart of everything we do at WHOA, and we hold a strong commitment to social responsibility with every adventure we take. Our special style of giving back is about sharing experiences with local women - it’s something that makes our adventures more meaningful and extraordinary for everyone. 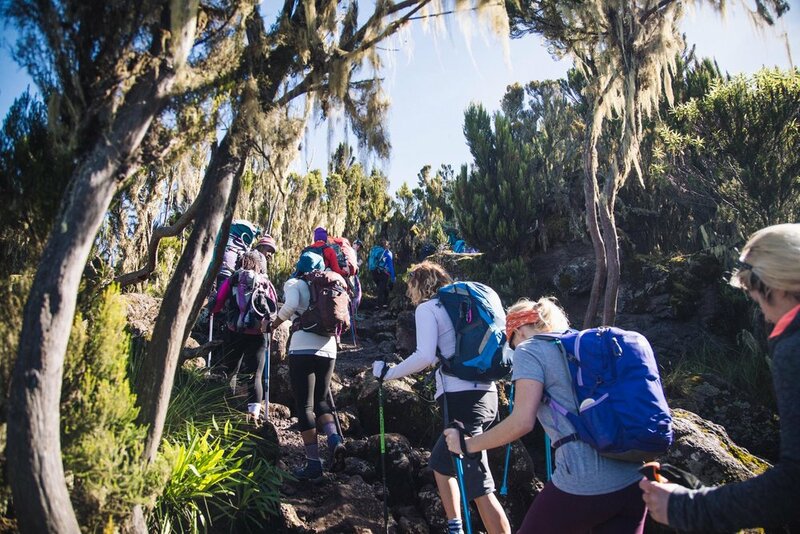 For Kilimanjaro, we provide the opportunity for local women in the region to join us on each climb to experience and conquer the mountain that they’ve lived under their whole lives. The stories and experiences we share with one another over the course of our adventures creates special connections that inspire and transcend the mountain. Our Tanzanian mountain crew is the best in the business, and you'll quickly become one big family on the mountain! Safety is of the utmost importance to us, and all of our mountain guides have received extensive training in first aid, mountain rescue, wildlife and are registered with the Kilimanjaro National Park (KINAPA). We also work closely with The Kilimanjaro Porters Assistance Project (KPAP) to ensure our crew receives ethical treatment and fair wages that they deserve. Like KPAP, we recognize the value of the demanding labor our porters perform, and we’re dedicated to helping them constantly improve the safety and quality of the Kilimanjaro experience for everyone. Above all, we make sure that all our adventures support women, the local community, and fill a need that is of value to our partners. For that reason, the partnerships can and do vary depending on their needs, the season, and the abilities and desires of our group. In each case, we do due diligence to seek out local partners that are doing valuable, sustainable work, and we work closely with them to understand their needs and create an experience that will truly be of value to them and you! This truly is a once in a life time experience that will stay with you long after it’s over! We encourage all of our climbers to include their family and friends that can’t come along. Bring a family heirloom or special photo to the top, and ask them join you in the training. Knowing that they are cheering you on from home will help you when times get tough. Also, embrace your new mountain family of fellow trekkers, guides and porters. You’re all in this together and are going to experience extreme highs and lows. Lift others up when they are down and they will do the same when you need it! Take in the views and share lots of laughter (and dances) with one another and you're sure to find beauty and surprises in many different forms all along the journey. At WHOA, we hold a big commitment to operating ethically and legally everywhere we adventure. We have a team dedicated to research and vetting partners, before customers ever step foot on a WHOA adventure. 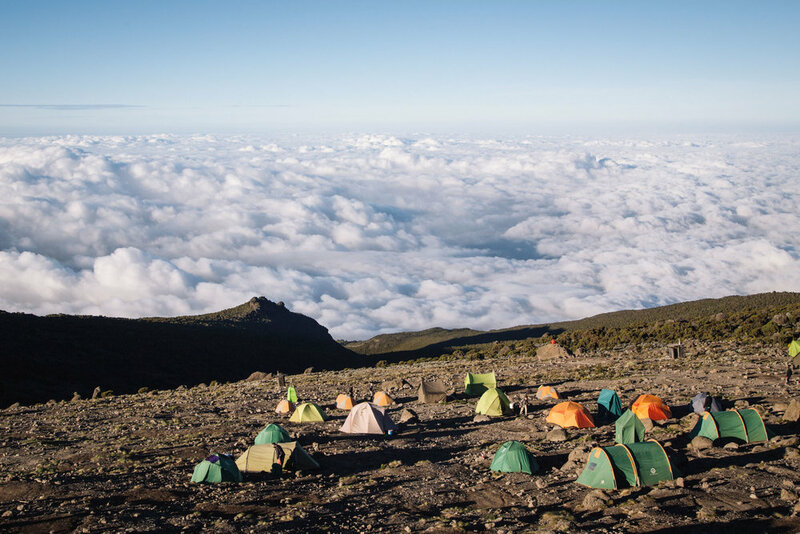 On Kilimanjaro specifically, we work with local ground operators who hold annual TALA licenses (which are mandatory to enter the mountain and obtain Kilimanjaro Hiking Permits). WHOA also works with partners who comply with the Kilimanjaro Porters Assistance Project. KPAP is a quality assurance organization, that ensures the fair and ethical treatment of all guides and porters through proper wages, meals, gear, and the transport of proper weight limits. As you will quickly find out, the guides and porters are the machines behind Kilimanjaro, and their fair and ethical treatment is extremely imperative to our operation! WHAT’S A NORMAL DAY ON THE MOUNTAIN LIKE? One of the great things about Kilimanjaro is that every day is a completely new and exciting adventure with diverse and different landscapes to take in! That said, there are some things that remain constant from day to day. Every morning you and your tent buddy will be woken up bright and early to pack up your things, have coffee, fill your water bladders, eat breakfast, and head out for a full day of hiking! We’ll be walking at a pace that is probably slower than you are used to (pole pole, as they say in Swahili), and this is to help your body properly and safely acclimatize. You’ll always have a certified local mountain guide with you when you’re trekking (we maintain a 1:4 guide/climber ratio), and we'll take several breaks for pictures, snacks, and a hot prepared lunch along the way. You will carry what you need for the day (layers, snacks, water, sunscreen, etc.) in your daypack, and our crew will carry all the tents, gear and your large duffel from camp to camp for you. They’ll usually have our entire camp set up by the time we reach it in the late afternoon - Did we mention how amazing these guys are!? When we get to our camps in the evening, we encourage you to enjoy the spectacular views and unwind a bit before dinnertime. Dinners are always well-balanced and usually consist of soup, rice or pasta, sauce, a protein and fruit for dessert. Bedtime is usually early, as you'll want to be well rested for the next day of hiking that awaits! Do you have recommended reading to help me plan and prepare for Kilimanjaro? Yes! Here are some great links to get you even more pumped and prepped for the big adventure! 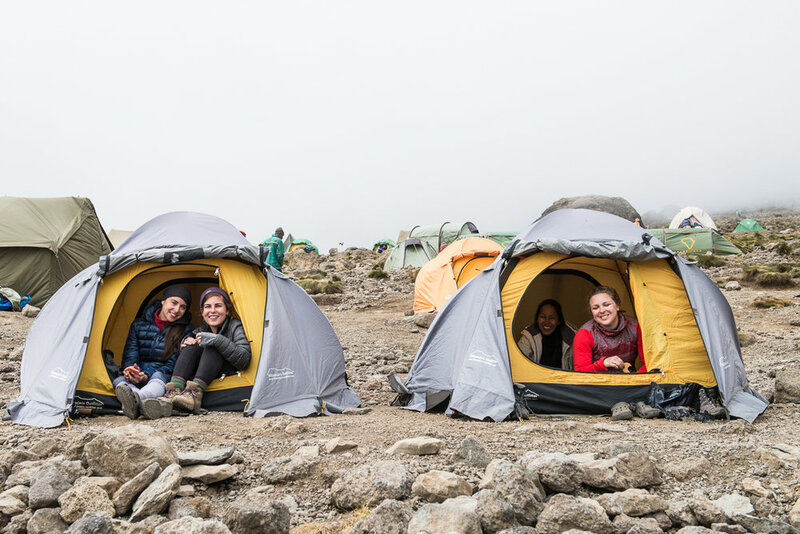 You can easily reserve your spot by visiting our UPCOMING KILIMANJARO ADVENTURES, and putting down your $500 deposit ($600 hike + safari) for the adventure you want to join! After you're signed up, our team will send you an invoice that will allow you to make payments on your adventure. The due date for final payment is about 3 months before the adventure start date. When do your Kili Adventures start to fill up and when do you recommend booking? There is no way to know exactly when a trip will fill up, but it's worth noting our adventures usually sell out with extensive waitlists, so the sooner you can book, the better. That said, we have a lot of dates to choose from (check out our UPCOMING KILIMANJARO ADVENTURES for all of them), so there's a great chance one of our adventures will work for you! CLICK HERE for a complete, up-to-date list of what all is included on our Kilimanjaro climbs and safari. There is a healthy mix of solo travelers and ladies who come with a friend, but the greatest thing about a WHOA adventure is that we walk in as strangers and leave as family. If you're traveling solo, we'll pair you up with another solo traveler to room with before the trek and tent buddy with on the trail. You'll be amazed at how quickly bonds are formed between our mountain family! Kilimanjaro is a significant physical and mental undertaking, so being in good shape will definitely enhance your experience! General aerobic fitness will allow the body to function efficiently with less oxygen and withstand the stress of consecutive days of hiking and camping. Additionally, having strong, conditioned legs will help make it easier to walk up and downhill all day. One of the best things you can do to train is walk, after all, that’s what you will be doing on the mountain! Ideally, try to train a few days a week walking and/or jogging on inclines to simulate the ascension on Kilimanjaro. (If you don’t have trails accessible, a treadmill or stair climber will do just fine.) Over the course of your training, it’s best to increase the time and distance while keeping a slow pace. In the end, if you can walk comfortably for 4 to 6 hours, with moderate elevation changes, while carrying some weight, then you’re probably in shape enough for the real deal. As with all training, for the last 2 weeks leading up to the big event, you should taper off and rest so your body has time to recover. While you’re training, don’t forget to break in your boots to prevent blisters! Also, try to wear the day pack you intend to carry so your shoulders/back/hips get used to the points of contact and weight. If you have the opportunity to hike at high altitudes, take advantage of it, so you can get used to the feeling of being active with less oxygen. For some, extensive training might not be necessary, but either way preparedness will make it that much easier to enjoy your time on the mountain. If you currently have an not-so-healthy lifestyle, use the climb as your motivation to change! Eat healthier. Drink less. Don’t smoke. Get more sleep. Don’t worry. Be happy! And remember, physical training is just one part of getting in shape. Having a positive attitude and a bigger reason will work wonders for you when you get tired and need that extra boost! HOW DO I PACK FOR KILIMANAJRO? This is one of our most popular (and important) questions! Check out the complete WHOA PACKING LIST AND GEAR GUIDE in our KILIMANJARO ADVENTURE GUIDE. It covers everything you'll need to be prepared! As always, feel free to reach out to us at adventure@whoatravel.com for recommendations, or if you have any questions. Yes! You can save yourself some packing space and money by renting some gear in Tanzania from our local outfitter. We’ll be sending all our adventurers a Pre-Adventure HUB to fill out before their adventure, so that you can indicate what you plan on renting, and we'll have it ready for you to pick up before you leave for the mountain. We currently offer rental of duffels ($20), gaiters ($10) and hiking poles ($15). Plan on flying into Kilimanjaro (JRO) as it's the closet airport to Moshi, and there are several flights that fly in and out every day. Flights to Africa from the United States are almost always overnight flights, so whatever day you plan to arrive you will want to leave a day earlier to ensure you arrive at your desired time. We recommend booking your air travel 3-5 months before your adventure start date to get the best deals. Along with the mandatory Global Rescue membership, we STRONGLY recommend you travel with a travel insurance plan to protect yourself in case of trip interruption, cancellation, lost/delayed luggage, medical expenses, and more. You can add-on supplemental trip insurance (policies provided through IMG) when you purchase your Global Rescue plan, or there are several other providers that could meet your needs. For travel to Tanzania you need an up to date passport (valid 6 months after your adventure dates) and a tourist Visa (approximately 100USD for US citizens, 50USD for all other nationalities). You may purchase your Tanzanian Visa when you get to the airport, JRO, but you can also get it beforehand through a Tanzanian Embassy or Consulate to avoid lines at the airport. You can find out more info about what is required to obtain a visa by visiting the TANZANIA’S IMMIGRATION WEBSITE and contacting your local Tanzanian consulate or embassy. After signing up for one of our Kilimanjaro Adventures, you'll receive prep emails with more specific information from us on applying for your Tanzanian VISA. WHAT SHOTS & VACCINATIONS DO I NEED? Please review the TANZANIAN TRAVELER'S HEALTH SECTION ON THE CDC WEBSITE for the most current vaccination listings, as they change and are updated often. Before hiking Kilimanjaro with WHOA, it’s mandatory for the safety of all adventurers that they see a doctor and have our medical forms filled out and signed by a physician. Our MEDICAL FORMS CAN BE DOWNLOADED HERE. If you are traveling from an at risk country, make sure you get and/or bring with you a signed International Certificate of Vaccination (it’s a small yellow card) as proof of your yellow fever vaccination. It’s worth noting that even though you have to visit a doctor, you can usually obtain shots through your local health department at a lower cost than through a physician. HOW DO I PREPARE FOR THE ALTITUDE? WHAT IS HIGH ALTITUDE SICKNESS? Drinking lots of water and going slowly on the ascent to give your body time to adjust to higher altitudes is the best and easiest way to avoid getting altitude sickness. That's why all our group treks are 7 days, as that ensures a safe and steady altitude gain, as well as built in "climb high, sleep low" days before the night of the summit. That said, it’s still perfectly normal for hikers to feel and overcome mild symptoms of altitude on the mountain. We take safety very seriously and our guides are experts at gauging your condition and health. In the case that a climber must leave the mountain due to severe altitude sickness, a guide will accompany them down. 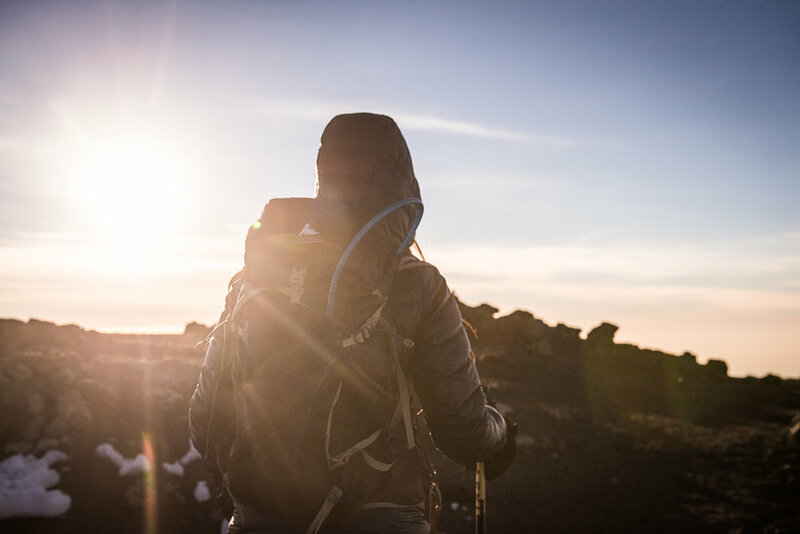 We have a helpful PDF of HIGH ALTITUDE TRAVEL NOTES & SAFETY INFORMATION in our DOWNLOAD CENTER, and encourage all our Kili climbers to read up and understand the signs and various types of altitude sickness before trekking Kilimanjaro. It's important to be educated, but don’t over think it - drink lots of water and know that our guides will be carefully watching and taking great care of you. Remember, it's completely normal to experience headaches, mild nausea and/or loss of appetite, but we've found that we're usually so distracted by how amazing the views are that we hardly notice! Great question! One of our WHOA GALs (Group Adventure Leaders) and/or drivers will be at JRO to greet you outside of the airport and bring you back to our partner lodge to meet up with the rest of the group. While you're on the mountain your extra luggage will be stored safely in our partner hotel's luggage room. We recommend bringing two luggage locks, one for the luggage left at the hotel and one for your duffel on the mountain! If you're staying on for safari, you will also store your luggage at the hotel, and only bring the items you need for safari! If you're catching your departing flight directly from safari, you will plan to bring all of your luggage with you on safari.